This special reenactment took place Jan. 28, 2012. 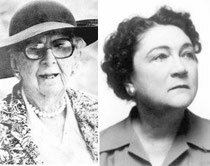 Marjorie & Marjory: Each was destined to be a Florida icon, but not many people know that Marjorie Kinnan Rawlings and Marjory Stoneman Douglas knew each other long before they were famous. Sharing husband woes and writing advice, the author of The Yearling (1939) and Cross Creek (1942) made sure that her friend’s book on The Everglades: River of Grass (1947) got plenty of attention. Join us for an evening with Betty Jean Steinshouer, who has researched each woman thoroughly and written substantial chapters on each for her book, Running South in Agitation: The Florida Journeys, which also includes chapters on Harriett Beecher Stowe, Constance Fenimore Woolson, Sarah Orne Jewett, Rose Wilder Lane, Edna St. Vincent Millay, Elizabeth Bishop and Anne Morrow Lindbergh. Act One will be Steinshouer’s portrayal of Rawlings, complete with salty language and poetry about the Big Scrub, that section of central Florida that gave us Jody and the fawn as well as the “Hyacinth Drift” chapter of Cross Creek. We will hear about her friend in Coconut Grove who served as would-be marriage counselor as well as a hunting and fishing consultant for Rawlings’ trips to south Florida. Act Two will move us ahead, past the death of Marjorie Kinnan Rawlings in 1953, when we join Steinshouer in her Chautauqua-style rendition of Marjory Stoneman Douglas, a few years after she had formed a group called the Friends of the Everglades in 1979. She will reflect back on her friends, Charles “Chuck” Rawlings and his wife, Marjorie. She will also give us her sometimes hopeful assessment of chances for survival of the Florida panther and its habitat, the Big Cypress Swamp and the surrounding Everglades. The word premiere tour of Marjorie & Marjory marks the end of Betty Jean Steinshouer’s 15 years of portraying Marjorie Kinnan Rawlings on the Chautauqua circuit. Just as she retired “An Evening with Flannery O’Connor” when she reached the age of 39, the age at which O’Connor lost her battle with disseminated lupus, Steinshouer will retire “Notes from Cross Creek, “ her full-length performance of Rawlings, after she reaches age 57 in the summer of 2012, the age that Rawlings was at her death in 1953.